We started off heading to their airbnb which over looked the BEAUTIFUL canyon in the distance! After having driven through the night to get there, my husband and I upon arrival had our coffees and were ready to go. 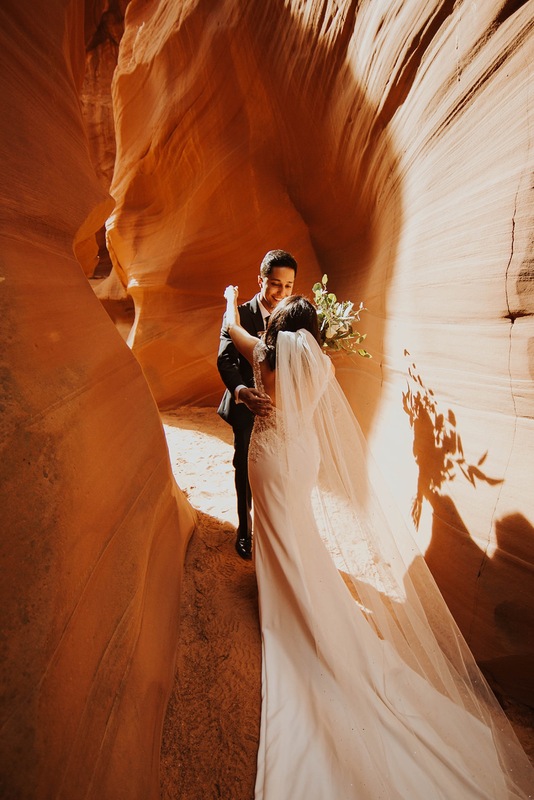 Morgan was so relaxed and excited to finally see Ryan - but the trick was, our first look was going to be in the Horseshoe Slot Canyons - and we had to take a bus out to the canyons. How were we going to get them on the same bus without seeing each other? Well, we blind-folded Ryan!! It was QUITE the site! And since it was so pretty on the safari bus ride out there, we put Morgan in the cabin of the actual truck (so she was hidden) and told Ryan to take his blind fold off so he could enjoy the sites. I’ll never forget: I asked Ryan how he was feeling, and he said something along the lines of “I’m so nervous to see her!!”. HOW STINKING CUTE IS THAT!?!? We eventually made it to the canyon, and I led Morgan in to see her groom. My husband had placed him facing away as we walked up, and as she tapped him to turn around, he started actually just crying. It was the cutest thing! Taking pictures in that canyon I think was one of the highlights of my year. It was so beautiful to look at, and it was even more fun taking photos and getting to capture it with two amazing people in the frame. It was SUCH a great day! Once the ceremony started, everyone was standing and crying as Morgan and Ryan committed their lives to each other. It was seriously such an honor to capture! And finally, when I got to steal them away for more photos as the sun was setting, we experienced an incredible sunset - one that MY photographs don’t even do justice. It was such a magical time taking photos in such a beautiful place! Then of course, we all danced our booties off at the reception and it was an incredible time - not to mention that the actual reception venue was IN THE MIDDLE OF LAKE POWELL, and we had to take a golf cart across a deck to get there!! Like, all the coolest places all in one day for such an EPIC wedding!